The European cargo van invasion is underway, with the arrival on these shores of the Ford Transit. At last! It offers the first true rival to the Mercedes-Benz Sprinter, with a high-roof model that can easily accommodate an upright refrigerator. The Transit is an incredibly versatile vehicle that can be used for many, many things. It can be had in a van, wagon, cutaway or chassis cab configuration. There are two wheelbases and three engines available. The Ford Transit is put through its paces. Photo by David Freers/Ford Motor Company. There’s a lot to like about the Transit. For starters, it’s a huge upgrade over the E-Series, the boxy, workmanlike van that has served Ford well as the best-selling commercial van for some 35 years. But overseas it was the Transit that dominated the van market and when Ford looked to consolidate its van platform, the Transit won out. And so it should. The Transit is a better vehicle in nearly every respect. Put the Transit alongside the E-Series and it’s not even close. Put the Transit beside the Sprinter and you have two very capable and attractive vehicles from which to choose. I drove a handful of Ford Transits during a recent test drive in Kansas City, where the van will be built. You can read my full report and view lots of pictures here. As for its cargo-carrying capability, pulling 1,500-2,000 lbs around in the back was nothing. If anything, the 3.5L EcoBoost engine was overpowered for the application. The standard 3.7L V6 (275 hp/260 lb.-ft) was just right. Unless you really need the acceleration or you want to max out the payload and towing capacity, in which case the EcoBoost is a nice option to have. And the 3.2L Power Stroke diesel was a nice option too, if you want the efficiency of a diesel, though the mark-up is sizeable. 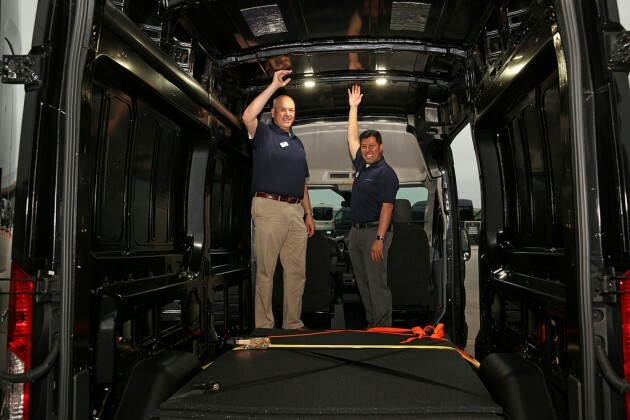 Ford officials show off the interior height of the high-roof van. Derek Bier, on the left, is 6’6″. Photo by David Freers/Ford Motor Company. I truly believe Ford has a winner in the Transit. They have an extensive dealer footprint and service network. The vans are priced well and these vehicles can do just about anything. The upfitting options really are endless. I feel there’s a place for the Transit even in the goods-hauling business. When you think about it, the European model of breaking down shipments outside the city for delivery into urban areas inside smaller, more efficient vehicles, makes a lot of sense here. Let’s face it, the big cities aren’t getting any more truck-friendly. And who wants to be wiggling a 53-ft trailer around downtown, picking up parking tickets everywhere you go? 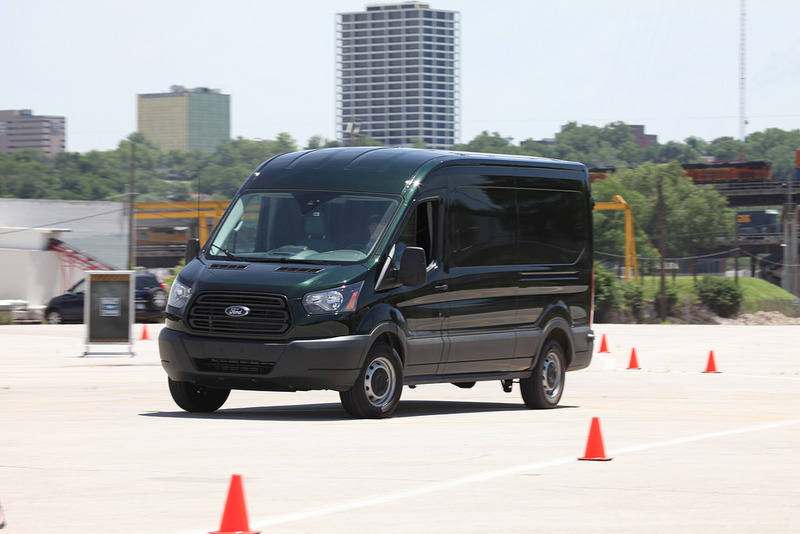 With its Transit, Ford has modernized the work van. This vehicle will do well.